For sufferers of fibromyalgia, crippling pain and overwhelming fatigue are a daily reality. The incurable disease causes chronic muscle pain and tightness, severe fatigue and decreased energy, insomnia, memory difficulties, migraines, reduced tolerance to exercise and many more debilitating symptoms. We know symptoms can get worse in certain conditions, as well as with fatigue, hormonal changes and stress, however very little is known about how fibromyalgia arises. The therapy for the condition is mostly undertaken by the patient, with aerobic and resistance exercise training recommended by the NHS. Relaxation techniques and better sleep techniques are also recommended, as well as the prescription of pharmaceuticals. Organic causes with secondary fibromyalgia (when fibromyalgia occurs as a result of another disease), also spinal diseases, inflammatory-rheumatic diseases and psoriasis. Studies have shown that after 20- 30 cold therapy treatments, clear and continued improvements are observed with the above symptoms. Combined with activating treatments such as mobilisation and flexibility exercises, performed one to three hours after cryotherapy, the therapeutic benefits can last even longer. Whole body cryotherapy is designed to trigger thermal stress that will promote blood vessel constriction and slow nerve signals, which results in pain relief. Such an effect can also act positively on sleep disorders and depressive symptoms that can occur with fibromyalgia, resulting in more restful sleep after just a few cryotherapy sessions. 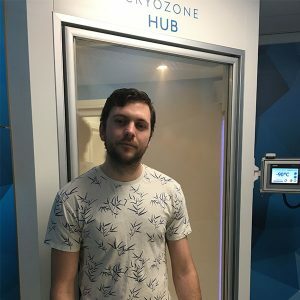 It is safe to say that the combination of improved mental and physical dimensions in a patient’s life as a result of Cryotherapy can improve the wellbeing of a fibromyalgia sufferer, and here at Cryozone Health in Shrewsbury, we have regular client’s who agree. “I suffer with fibromyalgia and chronic fatigue. I’ve struggled most of my adult life with this undiagnosed until two years ago at which point it was the worst it has ever been. With daily agonising pain I was barely able to walk most days. Sleep was impossible, I had body tremors and the list goes on. Luckily when watching a YouTube channel showing the effects of a cryochamber on fibromyalgia, I googled it and found one had just opened in Shrewsbury. The following day I went there and Lee and his dad were amazing explained everything to me, and how it would help. At the time I didn’t realise just how much it was going to better my life. The first couple of months I would go 2-3 times a week as advised and very quickly I noticed the pain was getting less and less and I was able to sleep properly for the first time in years. After 3 months I stopped all my meds and painkillers, at the time I was on 15-20 tablets a day, now I take nothing. Using the chamber has given me the chance to change my life. I got me back to the gym to strengthen my body, and with a well balanced diet too, a year later I’m a new person. I try to go at least once every two weeks now, as it also helps with my gym training. “On a daily basis I feel fatigued, have cognitive impairment aka (fibro fog) and have pain mainly in my left arm, legs hands, feet and back of neck. Many people think if you have a “good sleep and rest” you should feel refreshed, with fibromyalgia this isn’t the case. I don’t tend to tell people I have fibromyalgia as I find people don’t understand the illness. I first heard about Cryotherapy whilst at an SY TRI event one Sunday where Cryozone had a stand. We looked around the stand and I got talking to Lee who advised me on the benefits of Cryo for fibro sufferers. I was obviously sceptical to begin with. I was currently off work and had been put on meditation by my gp and advised to attend a support group for other sufferers. I can’t begin to tell you how traumatised I felt after attending the group. I truly thought that my life as I knew it was over and all I had to look forward to were quizzes, bingo and days out with people with the same illness with me. I cried after and my friend told me I sounded like I was giving in too easily. Now I’m only 43, have 3 sons, a husband and dog, I work and am very sociable, I wasn’t ready to give in so I was willing to try anything!! 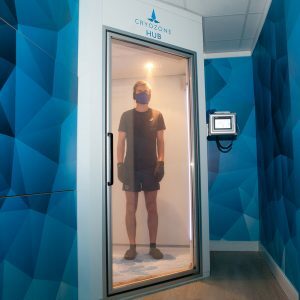 Cryozone gave me a free cryotherapy session voucher. I was so desperately in pain on the Tuesday I phoned and they got me in straight away. I was very impressed with the welcome I received. The difference I feel after a cryo session is amazing, I now attend twice a week straight after work and can be “on my knees” when I go in and come out feeling refreshed and my endorphins are through the roof. People start at 3 minutes in the chamber and I never thought I’d be able to do any more but having built up slowly I now do 5 1/2 minutes each session. I have had to make changes in my life, I’ve reduced my working hours to 24 per week I do take gabapentin and painkillers as required. Also I sensibly plan my week and along with preparation, delegation and rest this allows me to lead as normal life as I can given the Chronic illness. For more information on how cryotherapy can benefit you, please get in touch.